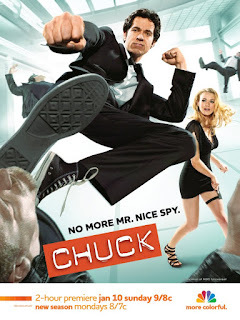 Yet another Chuck promo from NBC, which is good, but word around the campfire is FOX has moved up House's return to January 11 to muck up the Chuck Season 3 Premiere extravaganza. Petty move by FOX, but a good one to be sure. On a positive note, SyFy is going to be having a Chuck-a-thon on January 7 to hopefully increase the buzz, and gain additional viewers, for the season 3 premiere. I'm happy that NBC is putting so much effort behind the show's new season; I just hope it helps with the ratings.